Can parents cut through today’s media-dominated culture to raise independent, self-confident, motivated kids with a strong sense of right and wrong? The answer is a resounding “Yes!” in Who’s in Charge Anyway? by Canada’s leading parenting educator Kathy Lynn. She assures readers that when parents live their own values, kids learn what is expected of them. “Parents have to be the leaders,” says Kathy Lynn. “Unless we model, expect, demand and supervise standards for our children’s behaviour, they won’t learn to do what’s right instead of what’s easy. And even when they don’t seem to be listening, they’re watching.” In chapters such as Rituals & Routines, Parenting Teens, What’s the Magic Word?, I Want it Now!, and Child of the Community, Who’s In Charge Anyway addresses issues such as discipline, allowances, manners, chores, power struggles and family time. 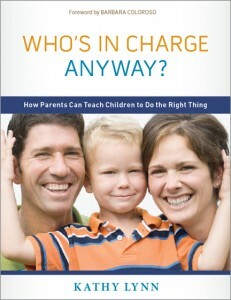 This book has received positive reviews by experts in the field and features a foreword by best-selling parenting author, Barbara Coloroso. This is an inspirational resource for parents of children from toddlers to teenagers written in a readable, jargon-free style. Debunking faddish notions of parenting (quality time, anyone? ), it delivers practical advice, real-life examples, and creative solutions to many dilemmas. Question-and-Answer sections highlight the key issues of each chapter with questions posed by callers to Kathy’s Parenting Today radio show and participants in her workshops. Who’s in Charge Anyway? empowers parents to create a bigger world, long before they have to face it.